Embarcadero Delphi® offers a rich API that enables developers to customize and extend the IDE in many ways. The goal of this whitepaper is to introduce a number of these APIs to you and provide samples on how they can be used. Among these samples are also a number of free IDE extensions provided by TMS software. The APIs available to extend the IDE are under the umbrella "OTAPI", which is an acronym for Open Tools API. 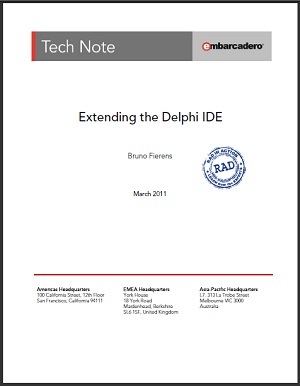 This whitepaper and the samples have been written for and tested with Delphi XE.